Inaugural PA3 Career Event a Resounding Success! The first sponsored career event by the PA3 has been a great success. We have assisted Satomi Yaji Chudasama of PU's Office of Career Services in organizing event for Princeton University students to help them select their possible future career. There were 71 student registrations, and 43 alumni registrations. 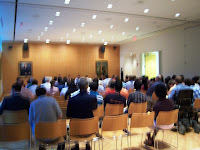 The panelists were: Yakov Shkolnikov *05, John Epstein ’96, John Korsah ’92, Seamus Abshere ’06, Ron Weissbard ’06, Murray Peyton ’57 and Steve Anderson ’91. Dozens of other PA3 members participated in smaller workshops organized by industry/profession. Extra: Also, please bring your gently used items for a diaper, clothes, and/or toy swap. I am sure many of you have a half-used box of too small diapers that deserve a good home. Pre-Rade ... help welcome the Class of 2012 to the Princeton family on Sept 7! The Office of the Alumni Association invites any and all alumni to attend the fifth annual "Pre-rade" on Sunday, Sept. 7, at approximately 4 p.m. Please come to the front lawn of campus, in front of Nassau Hall, to cheer on members of Princeton's newest freshman class as they march from Opening Exercises, through FitzRandolph Gate, to start off their undergraduate experiences. Following the Pre-rade, the Alumni Association will serve light refreshments in Maclean House. Then, keep the celebration going and join other PA3 members at a post-Pre-Rade gathering at Triumph Brewery (138 Nassau Street; Princeton 1.609.924.7855). 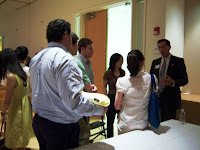 This summer, the Princeton Area Alumni Association (PA3) and the Office of Career Services at Princeton University are collaborating to host a networking reception for Princeton students and alumni who are living and working in the Princeton area this summer. Princeton students are extremely interested in obtaining information and advice about their future career options, while also developing skills and strategies for effectively networking for future internship and job search or preparation for graduate study. The event will feature a panel of alumni from various fields, sharing their insights on how Princeton has prepared them for future career options, success, and transitions. After a brief panel discussion, we will break into small groups so that students can hear more directly from you about your career advice, stories, and information. We would like invite you to join the reception, providing students with the opportunity to interact with you while you also interact with your fellow alumni. Alumni of all classes welcome, but space is limited, so please reply quickly! RSVP: Please send to Satomi Yaji Chudasama, Career Services, schudasa@princeton.edu, and indicate your first name, last name, class, and major at Princeton in your RSVP. PS: The event was a smashing success, with about 100 students and over a dozen PAAA members participating ... more to follow! 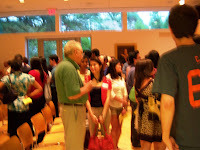 In August 2008, watch your email and snail mail for upcoming announcements (make sure that your details are correct on Tigernet; all alumni whose "preferred address" is within the region immediately surrounding Princeton, NJ are automatically members). We're planning numerous activities such as the "Pre-Rade" for incoming frosh from the Class of '12, happy hours, tailgates, career/networking events, play-dates for children, volunteer/community service projects and wine tastings. Want to join? volunteer? have any ideas for events? Please contact the Princeton Area Alumni Association.